If you want to be pampered, come to Sea Villa. In addition to its stunning common areas, you have access to an infinity pool, a Jacuzzi, outdoor space, and a private staircase leading down to the beach. On Long Bay, there’s a beach pavilion with bar service and recreation space. All in all, Sea Villa manages to pull of understated elegance and modern luxury. 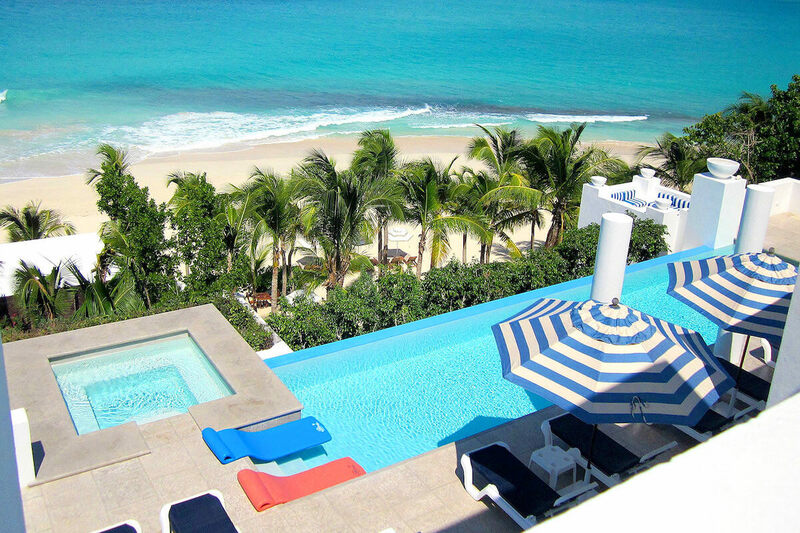 Sea Villa at Long Bay Villas is an oceanfront vacation rental steps from the white sands of Long Bay, Anguilla. This fully air-conditioned property offers stunning tropical views and gentle island breezes. Long Bay Villas features three villas, Sea, Sand, and Sky. All three share lighted tennis courts and a resort-style gym. Snorkeling, diving, sailing, and water sports are nearby as well. Sea Villa has a private stairway to Long Bay and a beachside pavilion with bar service. There’s also covered al fresco dining for 30, a BBQ grill, and beach chairs and umbrellas. Up at the villa, guests can relax in the heated Jacuzzi, swim in the infinity pool, or sunbathe around the terrace. There’s also covered dining on the terrace if guests prefer to feast in private. Lounging areas act as a gateway between the terrace and the common areas. Inside, guests can watch movies on the flatscreen TV, eat around the dining table, or cook in the gourmet kitchen. The villa has window screens and WiFi throughout. All five bedrooms have a marbled, ensuite bathroom, a flatscreen TV, and walk-in closets. Four bedrooms have a lounge area, an outdoor shower, terrace access, and king beds. One of these bedrooms can also be converted into a twin suite for children. The fifth suite has a small study and a king bed. There’s also an optional sixth suite for a crib or rollaway bed. The staff provides daily continental breakfast, butler service, 24/7 security, and housekeeping. This exclusive vacation rental is located minutes from Anguilla’s renowned Greg Norman golf course with dramatic sea view holes. CuisinArt Golf Resort, world-class spas, and West End restaurants are all a short drive away. The beach at Long Bay is a two-minute walk down stairs from the villa. Not included, but can be arranged for a fee. Welcome refreshments, daily continental breakfast, 8 hours of butler services, and beach drinks at the Beach Bar Pavilion. Car rental, private chef, server, grocery and beverage shopping (pre-arrival and during your stay), liquor and wine delivery, nanny service, baby equipment, spa services, yoga and personal training, photography, and private airport transfer/car service can be arranged for an additional fee.